To serve, first dip the rim of the glass into white chocolate coat with chocolate crumble and set aside. Then, pour the lime juice into the bottom of the glass. 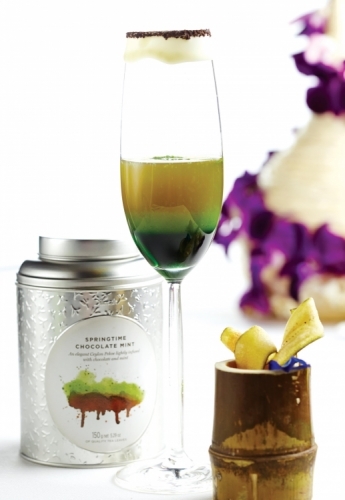 Using a cocktail spoon, add the chocolate syrup and then the mint syrup creating layers in the glass. Finally, place the brewed tea and fresh mint into a shaker with some cubed ice and shake well. Once chilled, strain and pour into the glass.